Instead of putting all of its addresses (except excluded ones) in a single scope, a server may use multiple scopes. One common reason for the latter approach is to support more than one subnet on a server. Multiple scopes are also commonly used when multiple DHCP servers are used to serve the same clients. There are two ways to do this: either by having overlapping or non-overlapping scopes. Overlapping scopes allows each server to assign any address from the same pool. However, the DHCP standard doesn't specify any way for servers to communicate with each other when they assign an address, so if both servers were told they could assign addresses from the same address pool, this could result in both servers trying to assign a particular address to two different devices. 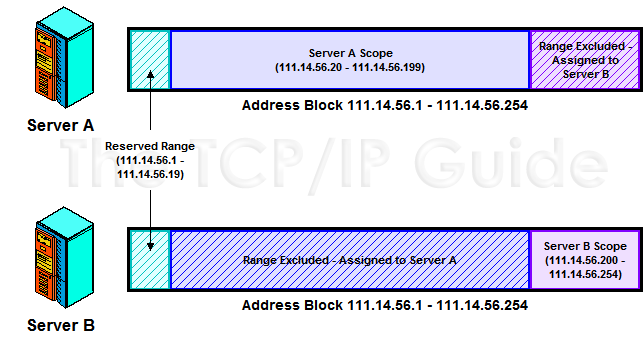 DHCP servers A and B have been assigned non-overlapping scopes to ensure that they do not conflict. This has been done by starting with the same scope definition for both. The common reserved range is excluded from each. Then, server A has server Bs address range excluded (shaded purple at top) and B has As range excluded (shaded blue, bottom). As a result, if you are using two DHCP servers (as is often recommended for redundancy reasons), the administrator generally gives them different, non-overlapping scope assignments. Alternately, the same scope is given to each server, with each server told to exclude from use the addresses the other server is assigning. For example, suppose we have two DHCP servers: A (the main server) and B (the backup). We want to assign most of the addresses to A and a few as backup to B. We could give both A and B the scope 111.14.56.1 through 111.14.56.254. Wed exclude 111.14.56.1 through 111.14.56.19 from both. Then we'd exclude from server A the range 111.14.56.200 through 111.14.56.254, and exclude from server B the range 111.14.20 through 111.14.56.199. Figure 261 shows how this would work. The main advantage of this method is that if one server goes down, the administrator can quickly remove the exclusion and let the remaining server access all addresses. Also, if one server runs out of addresses while the other has plenty, the allocations can be easily shifted. There are many other issues related to address management, which start to get into the guts of DHCP server implementation. For example, as was the case with BOOTP, we may need to use relay agents when the DHCP server is responsible for addresses on a subnet different from its own. There are also special DHCP features that affect how addresses are managed. For example, the DHCP conflict detection feature can actually allow two servers to have overlapping scopes, despite what we said above. The section on DHCP implementation and features gets into these issues in more detail. Key Concept: If a site has multiple DHCP servers, they can be set up with either overlapping or non-overlapping scopes. Overlapping scopes allow each server to assign from the same pool, providing flexibility, but raising the possibility of two clients being assigned the same address unless a feature such as server conflict detection is employed. Non-overlapping scopes are safer because each server has a dedicated set of addresses for its use, but this means one server could run out of addresses while the other still has plenty, and if a server goes down its addresses will be temporarily unallocatable.